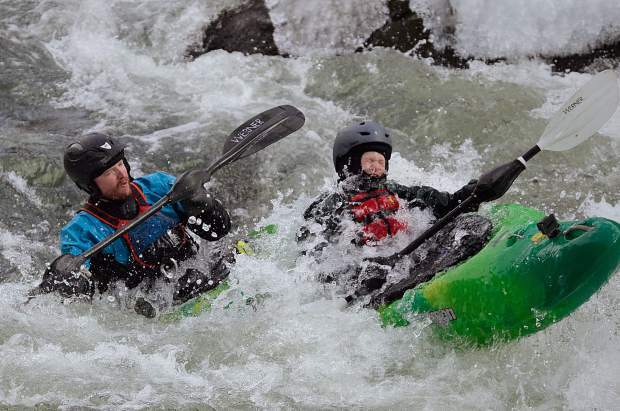 Kayakers and other river boaters again christened the New Year with a chilly run down Shoshone this Jan. 1. This long-running yet unorganized New Year’s Day tradition has drawn dozens of boaters to the icy waters in Glenwood Canyon during a time that most people assume is off limits for whitewater. Boaters made the run from the Shoshone rapids down to Grizzly Creek starting at about noon Monday. This communal boating trip brings out some extreme whitewater paddlers from across the state and beyond. Some boaters made the run only once, while others went back for half-a-dozen trips. “This whole event, if you can even call it that, is just a grassroots gathering of the most passionate paddlers in Colorado,” Peter Holcombe said during last year’s event. Holcombe and his wife and daughter have made the trip for the New Year’s Shoshone run for the past few years. And plenty of these river runners see each other only once a year, at this event. In the days leading up to the event there has been a lot of Facebook chatter from boaters checking in on the weather and the water levels. Some kayakers took an early run down the section a couple of days in advance and posted photos, noting the run was all clear for the event. Another boater from Colorado Springs chimed in that he wanted to go but didn’t have a way to transport his boat, and others quickly jumped onto the thread to offer their spare boats. While most rivers in Colorado dry up in the fall, the Colorado River, and in particular the Shoshone section, keeps a solid flow year-round, Holcombe said. The water may be low this time of year, but Shoshone is still about a Class III run. And the cold temperatures add some hazards to the mix. Though it could prove to be a (relatively) warm trip compared with previous years, this isn’t amateur hour. Boaters have to suit up in some serious warmies to stay safe in this kind of water. Last year saw a couple of boaters take a swim outside their crafts, but they were able to stay safe by being prepared with the proper gear. The event has been running for decades now, sometimes with only a few dozen boaters showing up. Last year was a pretty warm one for the New Year’s Shoshone run, at about 38 degrees. Last year an estimated 86 boaters took to the water, most in kayak, though a few rafts and even stand-up paddle boards made the run, as well. With a forecast high of 42 degrees on New Year’s Day and the lack of fresh snow, some boaters expected the turnout to be another record year for the Shoshone run.